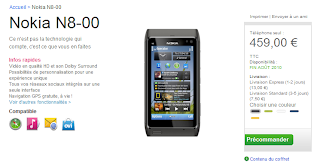 Nokia N8 opens for pre-orders in France and it is available for 459 Euro which is the lowest price so far around the world. Further, the sales package comes with all the standard accessories as showcased by Nokia. There is no external memory card included, however, you have lifetime GPS free. The delivery date of the phone is by the end of September as announced by Nokia. Nokia N8 has already opened for pre-orders in Italy and Germany and in 3rd party online store in UK.